MACRA seems to be the talk of the town right now. MACRA and MIPS and APM and the dozens of sub-acronyms flying around like so many arrows in this Game of Thrones, Battle of the Bastards. The Medicare Access and CHIP Reauthorization Act of 2015 (MACRA) was signed into law over a year ago. That’s right, MACRA is the “law of the land” now, and it became law of the land with overwhelming bipartisan support in Congress and with much lobbying and cheerleading from medical associations. MACRA is not a proposal. It’s not some random regulation. It’s not something that can be stopped or changed without an act of Congress. And MACRA is very lengthy and very detailed legislation. There is nothing surprising or unexpected in the recent publication of proposed implementation details that was not spelled out in the original MACRA text. It is possible that the degree of specificity in the CMS proposed rules for MACRA implementation finally hit home with the clarity absent from typical legislative language. It is also possible that an actual implementation date a few months down the road is more threatening than one that is a few years out. Either way, we are now witnessing a flurry of social media chatter lamenting MACRA, asking for changes in MACRA and demanding to stop MACRA altogether. I hate to say it, but all this huffing and puffing is a day late and a dollar short, folks. Amongst the avalanche of angry articles, militant tweets, desperate conversations, calls for action (commenting on the proposed rules), apologies and condescending propaganda, perhaps the most touching post I’ve seen came from David Introcaso at The Health Care Blog, which shows in great detail how the MACRA is not really measuring “value”. Dear David, MACRA wasn’t meant to measure anything. It wasn’t meant to improve anything. It was meant solely to aid and abet the McDonaldization of health care. Submitting MACRA comments to the CMS is like bickering over the choice of rope after being sentenced to hang by the neck until you are dead. Efficient, quantifiable, homogenized, controlled and dehumanized, that’s what health care must become, and when it does, health care will be plentiful, easily accessible and affordable for all poor people everywhere. Like Happy Meals. So how do we fight this? If you’re a physician in a leadership position, you don’t. Why should you? The more money we can save by cutting down “inappropriate utilization”, and the more money we can save by penalizing working doctors, the more cash will become available for executive bonuses. If you are a physician entrepreneur, you have bigger fish to fry. This is your once in a lifetime opportunity to invent a Zuckerberg platform for health care or a Bezos venue for online health care. If you just see patients from dawn to dusk, well, why are you doing that? There are leadership programs and entrepreneurial classes for doctors sprouting everywhere. If you’re old fashioned or driven by idealistic notions, get over it. We live in a globalized economy. We don’t live on Planet Earth. We don’t live in a global village, or even a globalized society. We don’t even live in the Matrix. We live in the economy. It’s the economy, stupid. It’s like the Serengeti, dumbass. Migratory herds of wildebeests, zebras, antelopes, whose sole purpose in life is to be eaten by big cats. Is there a way out? Can the wildebeests, stop as one, turn around as one, and vanquish the predators? They tried that in Great Britain the other day. They called it Brexit. The globalized economy is still reeling from that blow, and every fat cat, every hyena, every vulture and every maggot, mobilized to define the Brexiters as a bunch of racist, bigoted, uneducated, mentally challenged, Luddite, toothless old farts, too stupid to appreciate the majestic beauty of the Serengeti. On my Twitter stream some of the more frustrated physicians suggest that perhaps doctors should take a page from the Brits and stage a Drexit. True, revolution is contagious, but what does the doctor plight have to do with Brexit and globalization? On June 23rd the people of Great Britain decided by referendum that European Union technocrats, congregating in Brussels Belgium, shall no longer be empowered to dictate which tea kettle an Englishman can or cannot use. The Brexit was essentially a vote against globalization, against a common regulatory framework and against the free movement of labor to support a common market where the rich get richer, the middle classes gets poorer, and the poor get to work for a bowl of thin gruel. Globalization has been excellent for the elites and not too shabby for a slice of society immediately under the elites, while gutting the vast majority below. And the gutted majority was supposed to meekly accept the inevitability of this new world order. Is this starting to ring your liberty bell? There are approximately one million medical school graduates in the U.S. Of those, a small number are considered elites. These are the CEOs of big companies, the CMOs and CMIOs, the board members of every kooky startup, those who give keynote addresses at industry shindigs, those who write books, give interviews and do podcasts, those who shape and promote government agendas. Then come the thousands of highly specialized physicians who make money by the boatloads and are shielded from reality (for now). At the lower end are all other working doctors, with primary care bringing up the massive rear. The distribution of riches and pain seems similar to the UK, the US, and frankly, to a host of other third world countries. Whereas working people are told that they suffer from “anxiety” and various “phobias” (and stupidity), doctors are labeled “burned out” or “suicidal” (or disruptive) when failing to live up to the McDonaldization of life in the global economy. The elites of course are immune to these afflictions due to their superior visionary intellect. The rest of us need to be gently “nudged” to alter our “behavior”. Physicians need to have their “culture” and “readiness to change” evaluated. We all seem to need remedial education for how to “communicate”, how to “transform” or “adopt change”, how to be “sensitive”, and how to be grateful for all the unearned “privileges” we enjoy while billions of others are worse off. My grandma used to make similar arguments for why we should eat her revolting creamed spinach, but let’s go back to globalization. Remember when we used to say that all health care is local? We don’t say that anymore. Now we have centers of excellence far away from home and small rural hospitals that are all but doomed. Dr. Phil and Sir Richard Branson want me to get medical advice from strangers in other states. My TV frequently advertises state of the art hospitals in Dubai. Transcription services, claims processing, utilization reviews, and even radiology services have been globalized already. As technology pushes itself into medicine, with apps and artificial intelligence and even those pedestrian EHRs, remember that computers, tablets, phones and such, are all made in China’s slave labor camps, software is largely made in India or Pakistan or by imported slave laborers, maintenance and help desks are mostly overseas and some are in private American jails. The lethal combo of HITECH/ACA/MACRA is essentially a redistribution of payments from local doctors (and the local people they employ) to cheaper semi-skilled and unskilled labor across state lines and across the globe. The benefits accrue to global corporations directly and indirectly, because profits in globalized business models are much larger, and the locus of power is shifted from geographically anchored professional expertise to global technocrats. This is not a disruptive innovation. From the days of Nebuchadnezzar to the East India Company and beyond, those who wished to rule the world understood that commandeering and destroying local infrastructure and uprooting people are the best ways to foster compliance with centralized governments far away. Unlike the Brexiters, physicians have no country of their own, and the Gomer Blog notwithstanding, there is no mechanism for a referendum. There is no Union or Guild or national body that could allow doctors to organize a serious Drexit that will pull all doctors, or at least a critical mass of practitioners, out of the acronym games. But even if a Physician Union existed, it is not clear what doctors would want to exit. Do they opt out of Medicare and Medicaid en masse? Do they opt out of all insurance contracts, because they are essentially the same? Not likely. Perhaps a small number of physicians who provide the least expensive services could survive in cash only practices, but the vast majority could not. And the producers of HITECH/ACA/MACRA know too well that this kind of Drexit is not an option. But there is a softer type of Drexit. One choice is to pay for protection. This is a time honored method for keeping bad guys from raiding your small business. 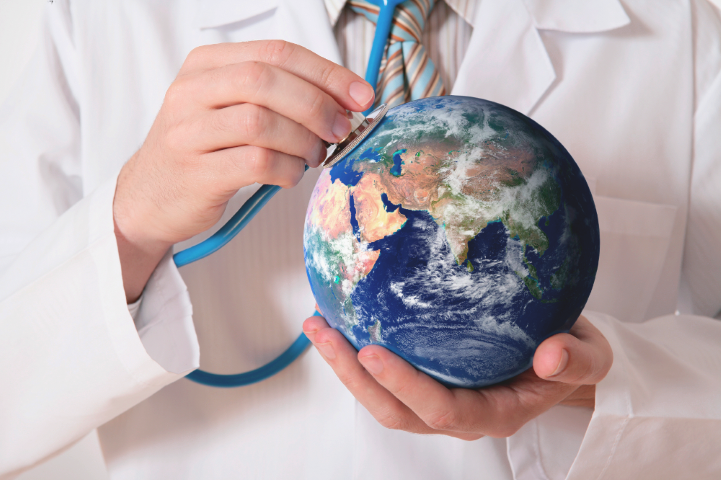 There are companies, health systems and even insurers that will bundle physicians of all specialties into large organizations to better cope with large regulatory climates designed for the global economy. Theoretically, you can remain independent in such arrangements. Theoretically. The other choice is an equally time honored method for standing your ground. Civil disobedience. You don’t have to comply. Nobody is going to take your medical license away, and considering the meager ratio of physicians to population, nobody is going to prevent you from seeing patients. They will however pay you a bit less than if you complied with HITECH/ACA/MACRA. Think of it as an independence tax (low single digit percentages) over the next decade or so. If you sit down and calculate the price you’d have to pay for compliance with regulations, including opportunity costs, you will find that civil disobedience puts you slightly ahead or, at the very least, it breaks even with compliance. Bottom line here is that you need to do your own math. Ignore the rhetoric. Ignore the doomsayers and the saviors of mankind. Every single person who opens their mouth on this subject has a vested interest that may or may not align with your interests, and the interests of your patients. Remember that the technocrats at the CMS are forecasting that you will be taxed no matter what you do, so why spend money and effort on a rigged game? Instead, turn it around. Refuse to serve in the army of globalization on moral and ethical grounds. Wear it like a badge of honor. Advertise your Drexit. Make a poster for your clinic. Put it on your website. Stand with your patients. Let them know that you put patients first and money a distant second. Be a conscientious objector to a world order where we the people don’t matter anymore.